Maybe it’s just me, but I was under the impression Corpus Christii were some sort of Industrial-Goth band the first time I saw one of their gothic-tinged pieces of cover art, let alone from their name. 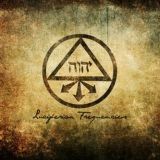 Looking at Luciferian Frequencies, the Portuguese one-man-band’s seventh full-length, you probably thought that as well. Yet on sticking it on, you discover something quite different, traditional black metal in execution if not in effect, purely riff-driven in a way that’s quite different from their countrymen in Moonspell. Main man Nocturnus Horrendus (owner of Nightmare Records, interestingly) is here joined by drummer Menthor, who backs his interestingly diverse guitar up well. Ranging from old-school fuzz to more modern dissonance a la Deathspell Omega, it’s the riffs that draw you in and it’s the riffs that keep you interested. I suppose mid-period Watain or Darkthrone just pre-Too Old Too Cold is the best comparison to make, as well as that all-important DsO factor. When this band is angry, it’s passionately furious, The Styx Reflection’s howls and torrential blastbeats falling on your head like a landslide. Nocturnus mixes his typical snarl with moments of harrowing shrieking, sure to send chills running up and down your spine, as well as slightly hammy distorted spoken or shouted sections that fit in well but could easily have been dropped without harm. The success of this band is in how it picks up the listener and carries them along on a wave of righteous Satanic fury, moments of relative doom-ridden calm allowing you to breathe before the torrent begins afresh. Woe betide you if you fall off the band’s esoteric wagon, however, as it’s then that you notice the cracks in the facade. The repetitious feel, the impenetrable song structures, the one-note execution. Nocturnus is on a journey here, as you’d expect for someone who’s been working hard with this band since 1998. It’s his journey, however, for him alone to truly understand. The almost catchy groove of The Infidels Cross could not be mistaken as a mainstream bid by anyone, an almost callous eeriness to the distorted bass twangs and meandering riffs turning soon to coldhearted blasting. Or take Paths Of Human Puzzles, rising and falling like waves on an angry ocean, Nocturnus’ snarls not revealing either puzzle or answer. It all adds up to an involving album which you will struggle to enjoy, sensing that there is intelligence behind it all but not being granted the knowledge which would unlock it for you. A frustrating listen that nonetheless will be returned to again and again, all the more interesting for this being Corpus Christii’s Candlelight debut.